Explain what to expect. 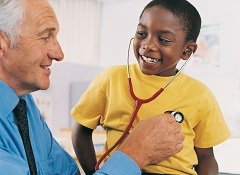 Before the visit, take time to talk with your child about what happens at a doctor’s office. Children, like many adults, are often anxious when they don’t know how something will turn out. You can help to take away your child’s fear of the unknown by describing what the appointment consists of and answering any questions that your child might have. You also may want to role-play the visit with your child or with a toy, as your child watches. Don’t make false promises. Don’t take an easy way out by telling your child, “It won’t hurt” or “you don’t have anything to worry about” because, for example, if the shot does hurt, your child might lose some of the trust that he or she places in you. Instead, be honest with your child by noting that the shot might sting or pinch, but the good news is that it will be over very quickly. Provide comfort. If your child fears being left alone, assure him or her that you will be with your child the entire time. To ease that fear a little more, your child could bring along a favorite stuffed animal While in the waiting room, you might want to hold your child on your lap. Since a doctor’s office may look cold and bland or unfamiliar, small comforts can make a world of difference toward alleviating your child’s fear of doctors. Help your child to feel positive about the experience. After the doctor’s visit, you may want to tell your child how proud you are, give your child lots of hugs or stop for some ice cream. Even small gestures such as these can help your child feel positive about the experience and more likely to associate a trip to the doctor with something good, rather than something bad. In addition, you could talk with your child about something nice that happened during the visit, such as the cute sticker that he or she received from the nurse, the funny joke that the doctor told or the neat books and toys in the waiting room.